Last summer I was fortunate enough to welcome two wild bunnies into my home. Dandelion and Buttercup are two little brothers who were found on a caravan site in Essex. Their nest had been disturbed by children, and as a result three of the five babies had died. Mother rabbit then abandoned the nest and when a heavy downpour threatened to flood it drowning the remaining babies, a gentleman decided to take them home and handrear them. It was his last day on holiday and Dandelion and Buttercup began their new life travelling 100 miles to his London flat. The bunnies were very small, undernourished and still with their eyes closed (which meant they were under 10 days old), but the little troopers soon thrived in spite of being given a less than suitable milk formula, no probiotics and no vitamin and mineral supplements. Buttercup and Dandelion quickly made themselves at home and spent the next two and a half months living with two children, a cat and a terrier dog who they chased under the bed. They also survived visits to the local nursery school and meeting dozens of children. Attempts were made to confine them to an indoor cage for part of the time, but they soon worked out how to open it and took great pleasure in exploring the flat while their caregiver was at work. When Dandelion and Buttercup became a bit of a handful their rescuer asked Cottontails to take them in and we gladly accepted. I have always been very interested in rabbit behaviour and even though one of our volunteers had fostered wild rabbits and even a hare, I had never had this opportunity, and was looking forward to caring for Dandelion and Buttercup and observing them close by. I expected their behaviour to be similar to that of domestic rabbits, but over the following months I found it to be virtually identical, down to their social habits, choice of toys, and preference for staying indoors and enjoying their home comforts. Dandelion and Buttercup are very handsome and healthy and a reminder of how rabbits are meant to look. They have beautiful long faces and enormous brown eyes positioned so that they can literally see at the back of their head! In contrast it’s sad the way rabbit breeders have developed certain features with complete disregard for the animals’ welfare and longevity – huge dewlaps that prevent them from cleaning themselves and short jaw bones that literally leave no room for the teeth, to name two. When they first arrived Buttercup and Dandelion lived happily with my rabbits Peanut and Sweetpea. Sweetpea has never got on with other males and tended to bully the wild bunnies a little, but they tolerated it good-naturedly, and being very agile they would simply get out of his way. Besides Sweetpea has no incisors and couldn’t bite Dandelion and Buttercup. As soon as the wild bunnies were old enough I had them neutered to minimise their chances of fighting. Unfortunately as time went on they became more confident and began attacking Sweetpea. The scuffles started on 6th October 2002 and over the following week I attempted to reintroduce them but the wild bunnies had become increasingly bold and would not back down. Sweetpea, who was then six and a half years old and recovering from an abscess, became so frightened that he took up residence on the back of the sofa and refused to come down. So reluctantly I had to accept that I could not keep the four rabbits together and moved Dandelion and Buttercup to my sitting room in the daytime, while at night they have the run of the flat. With hindsight another factor probably contributed to the rabbits falling out – the arrival of a female foster bunny just a week earlier, on 29th September. 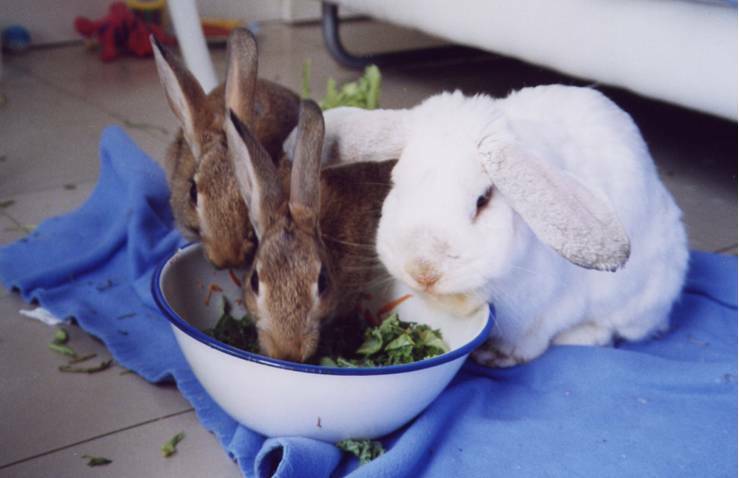 After the rabbits were separated Peanut spent some time with Buttercup and Dandelion every day and initially they remained good friends. But following a prolonged separation due to Peanut’s illness their relationship changed, and now Peanut despite not being very well and having had an eye removed likes to assert herself as top bunny, chasing Buttercup and Dandelion and generally reminding them who’s boss. Because she’s physically frail we have decided to keep them apart from now on to prevent injuries and stress. Although they are no longer friends, Buttercup and Dandelion can still see my rabbits and interact with them through a partition. Sweetpea particularly enjoys chasing them while they’re in their run, knowing that they can’t catch him! Of the two rabbits Dandelion is the more affectionate and loves to lick my hand and meet and greet people. Buttercup is still quite shy but he’s willing to come out of his shell and give me a few licks when I spend more time with him, and likes to have his back rubbed. Except for doing health checks and carrying them to and from the garden, I don’t pick up any of my foster rabbits, and Buttercup is certainly very nervous about being held while Dandy is more relaxed and does not run away after I put him down. The bunnies are very patient and sweet-natured and will only give me a nip if I’m in their way or they’ve had enough of being petted. Dandelion and Buttercup are a delight. Their cheekiness and sense of adventure would brighten anyone’s day and are a joy to watch. They are incredibly strong for their size and like to headbutt the top of the run to escape (which they succeeded in doing before it was reinforced). Like all rabbits they are very smart and inquisitive, not to mention persistent – one of their favourite activities is banging the baby gate to get attention. Dandelion and Buttercup are very active, which explains why most of the photos I take of them are a blur, however they have calmed down a little since their first birthday and enjoy having a long siesta in the daytime, usually on top of a cabinet or other piece of furniture. The bunnies like to have a good view and spend many hours sitting on a table by the window to the amusement of neighbours who greet them each morning on their way to work and in the evenings on their way home. They are currently very annoyed that their room is being redecorated and have been doing a lot of scratching on the door since they haven’t been allowed in. One night they made so much noise we thought we were being burgled! Buttercup and Dandelion have been quite well behaved around my home, except for nibbling a pair of curtains in half because they blocked their view from the window, chewing a telephone cable, the washing machine pipe, some paperwork and two table legs. They have become more destructive since I’ve had to separate them from my rabbits. Obviously they feel a bit left out, and I make an effort to talk to them and visit them for a cuddle or a treat a few times a day. The bunnies’ favourite toys are wire balls they can toss and boredom breakers and wire cubes filled with alfalfa hay. Both love to play piggy back and will climb on my back whenever I bend down to be taken for a ride around the flat. Dandelion is the more athletic of the two and when he was based in the Bunny Buys storeroom he would leap effortlessly from one pile of boxes to another a few feet away, earning the nickname “Tarzan”! Buttercup has invented his own game which we call “The magic carpet”: he burrows under a fleece rug, and stays put for a little while, thinking nobody has noticed the bump in the carpet. He then peeps from under the edge looking very pleased with himself before diving under the rug again! Buttercup loves to hide around the flat and my heart skips a beat whenever I can’t find him. Once I had to enlist the help of neighbours to look for him, we searched the whole flat and garden several times without success. Finally at dinnertime Buttercup turned up looking very smug and a little hungry. We concluded he must have been hiding behind the fridge (we had looked but didn’t check under the condenser). The following day he disappeared again so I immediately looked behind the fridge thinking he’d be there but there was no sign of him. To this day I have no idea where the little guy was hiding. I am amazed he can find any hiding places at all since my flat is quite neat and there is hardly any furniture (except for bunny furniture that is!). Buttercup and Dandelion require more supervision than the average rabbit when loose in the garden because of their agility, colour and size – they are not much bigger than a squirrel and could escape through the smallest hole in the fence. On two occasions Buttercup jumped in the narrow gap between the fence and the wire netting and got stuck. Luckily it was where the fence reaches the ground and there were no holes for our intrepid explorer to investigate. But their safety when outdoors is a concern and if money was no object we would build a wall around the garden (hopefully we will raise enough funds to do that in future). Even though they grew up with a cat, Dandelion and Buttercup are rightly wary of neighbours’ cats coming in the garden and will thump and run for cover when one appears. They are very alert to danger but not more so than the majority of pet rabbits as they’ve got used to my household’s smells and sounds. As well as hopping around the garden, the bunnies enjoy digging in the sandpit, jumping on flowerpots and running in and out of tunnels. However they don’t feel completely safe outdoors and usually come in of their own accord after 20 minutes to half an hour, which is just as well as Buttercup would be very difficult to catch! Like the other foster rabbits, they don’t like being in a run and look miserable when they are confined to it, constantly trying to catch my eye as if to say “Let me out!”. Usually in the mornings they hide in the cupboard under the stairs or some other hard to reach place to avoid being put in their run, while in the evenings, when they know I am not going to put them outside, they will happily come out to greet me and beg for peanuts. Considering they are wild bunnies, Buttercup and Dandelion don’t eat a lot of grass, preferring choice fruit and vegetables, timothy and alfalfa hay. They also adore nibbling on vine leaves and willow twigs, as well as geraniums and herbs, which we plant especially for our foster rabbits. Caring for Dandelion and Buttercup has been a wonderful experience and has made me question the popular view that wild rabbits should be released in the wild once rehabilitated, as these bunnies have become very tame and are no different from our domestic rabbits. Since Cottontails keeps all its foster bunnies free range in multiple rooms and the garden (in the daytime with supervision), we believe it is in the best interest of the wild rabbits we care for to be treated in the same way, i.e. be rehomed to a similar environment or stay on as sanctuary bunnies. Nature isn’t kind to rabbits and except in special circumstances it is now our policy not to re-release wild foster rabbits just as we wouldn’t dream of abandoning our other rescue rabbits in the wild.